I was sitting in a grandstand recently watching my son play football, enjoying the game, except for the thousands of extra tiny spectators sitting a few rows down. They were yellow jackets feasting on the leftovers from a game the previous evening. These pesky insects can also be dangerous. I started thinking, why does the school let this happen? What can they do to safely remove or discourage these pests? What would happen if the little spectators began to get agitated? This problem is not limited to yellow jackets. 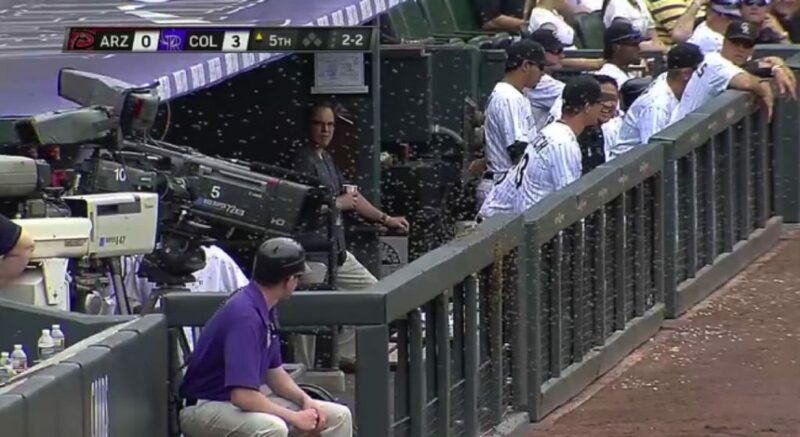 You will often find bees and other species of wasps attracted to your sporting events. You might wonder if you need to worry about this on your grandstand. The short answer is yes. 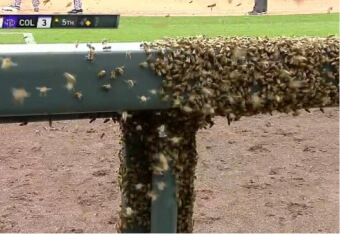 Thousands of stings happen every year at sporting events across the nation. In Pleasanton, CA more than 70 people were stung by yellow jackets at the Alemeda County Fair during a fireworks show. The wasps were disturbed by the booming of the fireworks show from their underground nest. These old bleachers above became a perfect nesting ground for these pests. (More pictures of swarming pests at the bottom of this page). Clean up after each game. Don’t wait until morning. Yellow jackets and bees love to feast on the leavings after a game. They are particularly attracted to foods that contain protein and those sweet sugar snacks. Empty all trash containers after a game. Even if your grandstand/bleacher is clean, the insects will still converge on a trash can if given the chance. Place traps around and under your grandstand to catch any stray “scouts” that may be looking for a meal. Grandstands with gaps or cavities in the riser portion should be covered. Interlocking deck grandstands with gutter systems can be the perfect nesting ground for bees and wasps. Find a way to clean the system out regularly as the insects love the soda syrup that gets trapped in these gutter systems. If you already have a problem with bees and wasps, try hanging some non-toxic traps nearby. 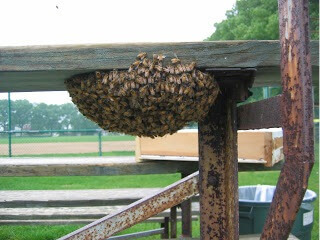 Hire a professional to remove the pests safely (Honey bees are protected). Work on some of the suggestions above. All situations are unique, just as each grandstand is different. 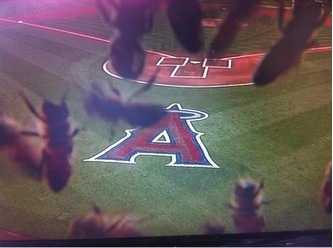 Keep your spectators safe and let’s hope they enjoy the game without the fear of being stung.